These quick and easy skillet chicken breasts are served with a simple creamy pan sauce infused with dill. Use fresh dill in the recipe if possible. This dinner entree is delicious for a family dinner but elegant enough to serve to guests. Serve the chicken breasts with the sauce and hot cooked noodles, rice, or potatoes. For side vegetables, add steamed broccoli, green beans, or these simple buttered snow pea pods. Sprinkle the chicken breasts with seasoned salt. If the chicken breasts are quite large, slice each one in half horizontally to make two cutlets. For faster and more uniform cooking, put each chicken breast or cutlet between two sheets of plastic wrap and gently pound with the smooth side of a meat tenderizer. In a large skillet over medium-high heat, melt the butter and olive oil. When the butter and oil are hot and sizzling, add the chicken breast halves or cutlets to the skillet. Cook for about 3 to 5 minutes on each side or until chicken is browned. Reduce the heat to low. Add the chicken broth to the skillet; cover and simmer 10 to 12 minutes or until chicken is cooked through. Remove the chicken breasts from skillet to a hot platter; tent them with foil to keep them warm. In a small bowl, combine cream or half-and-half, flour, and dill; whisk or blend with a fork until smooth. Add the flour mixture to the skillet; cook and stir until the mixture has thickened. 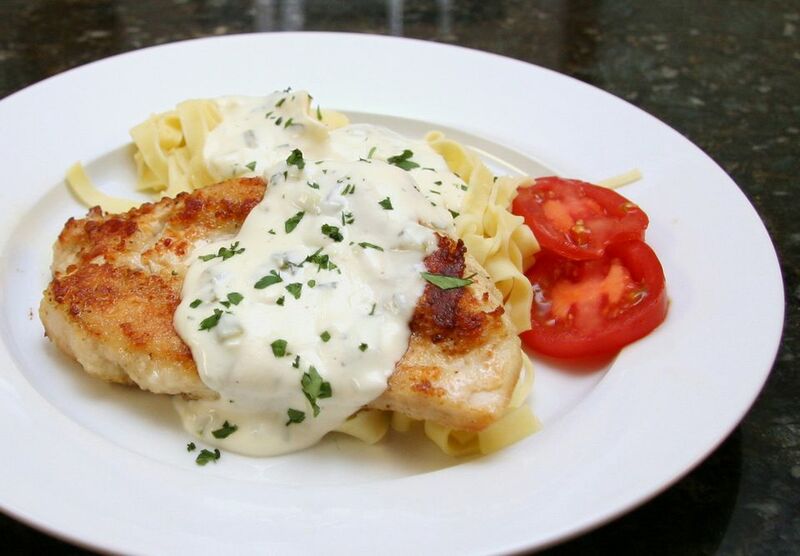 Serve the creamy dill sauce over chicken breasts with rice, noodles, or potatoes and your favorite side vegetables. Store any leftover chicken and sauce, covered, in the refrigerator. You can reheat the chicken and dill sauce in the microwave for a great lunch or dinner the next day. For a burst of garlic flavor, after the chicken is removed from the skillet, add 1 teaspoon of minced garlic and cook over medium heat, stirring, for about 2 minutes. Add the cream and flour mixture and continue with the recipe. Gluten-free substitutions for the flour in the sauce include using the same amount of sweet rice flour or sorghum flour. To make your own seasoned salt for this recipe and others, combine 1/3 cup of salt with 1/4 cup of onion powder and 2 tablespoons each of garlic powder, white pepper, and paprika. For an herb and salt blend, add 1/2 teaspoon each of marjoram, thyme, and celery salt.